Equine Lawyers are Horsemen and Horsewomen that understand the Legal Requirements of horse ownership and practice Horse Law. We gone to great lengths to find Horse Attorneys who have the knowledge and experience necessary to assist you with all Horse legal matters. While the Lawyers here do not work for free, they are all very happy to set an appointment with you and address your legal needs. 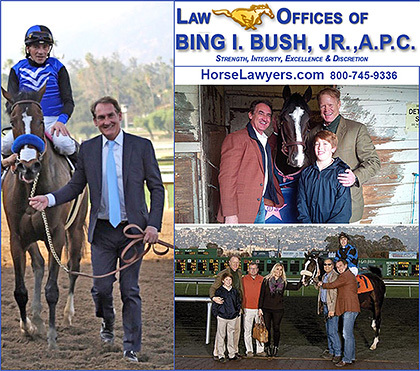 Feel free to call for an estimate of services and to see which Lawyer can best serve your equine legal requirements. Attorney Advice by Bing I. Bush, Jr.